There are 21 Basic WooCommerce metrics (seen below) available to track right out of the box. Basic metrics are the standard ones available through WooCommerce. While you can visualize these metrics in a variety of ways, we’ve gone ahead and pre-built 21 visualizations for these metrics, meaning all you need to do is drag-and-drop them into your dashboard in order to visualize the data. There are 3 calculated metrics (seen below) available, too. These are custom metrics that are commonly created by WooCommerce users that we’ve created using Data Calculations. These are also available as pre-built Datablocks. No code or design skills necessary. 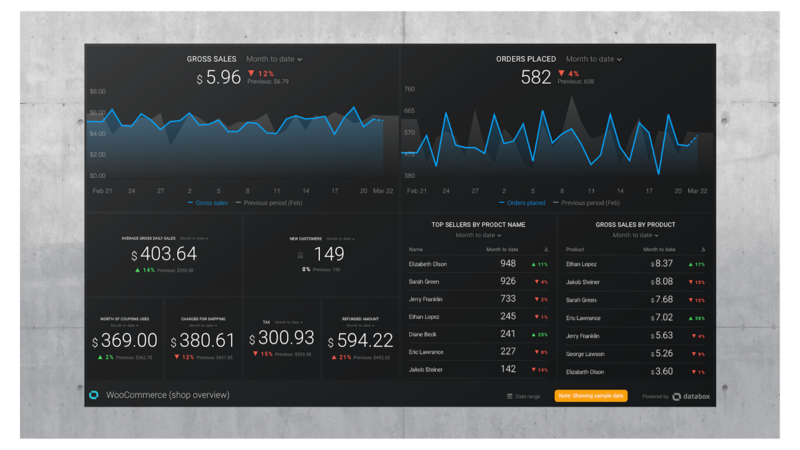 So, the quickest way to visualize your store’s performance is by downloading our free WooCommerce dashboard. 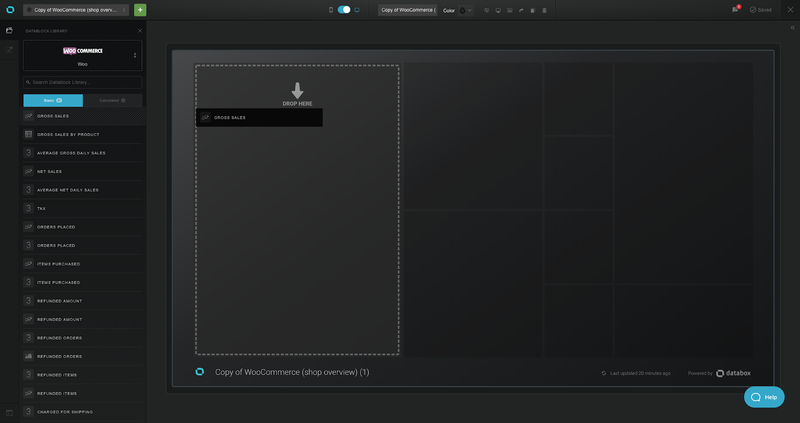 Once you download the template, you’ll be prompted to connect your WooCommerce account. 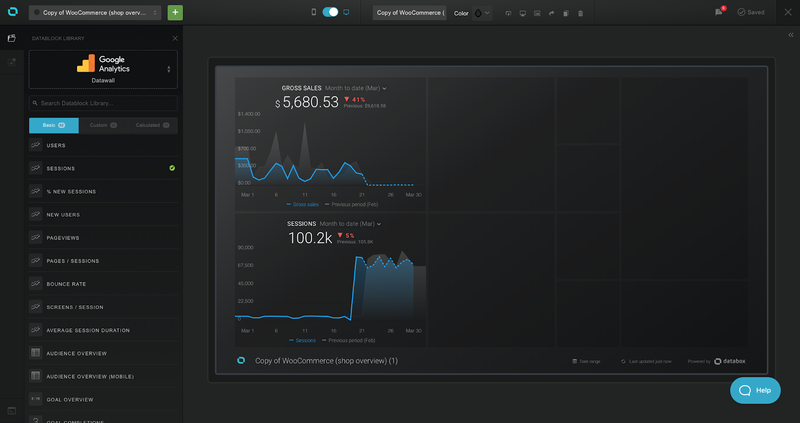 After you connect your account, watch as all of your store’s KPIs instantly visualize in your new dashboard. 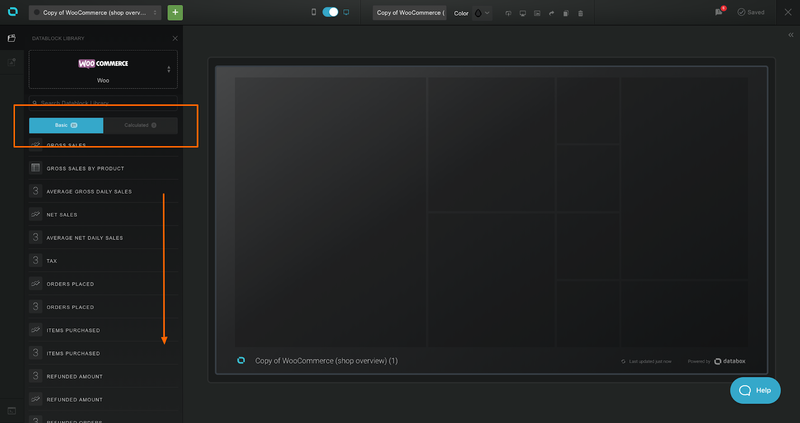 Want to customize your dashboards to include metrics from different sources? Easy. Let me show you how. 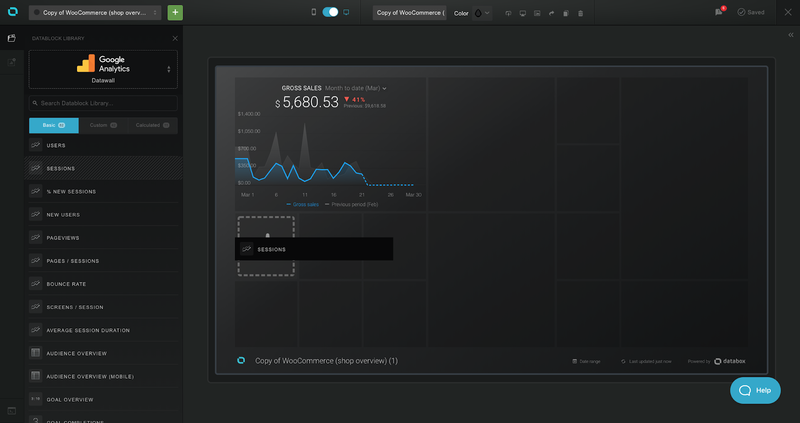 In the dashboard designer, search for the WooCommerce integration on the left side menu. Next, you’ll need to connect your WooCommerce account. 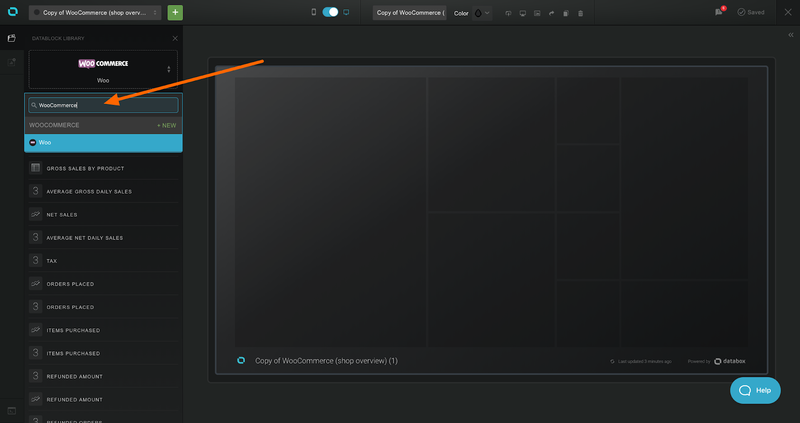 Drag-and-drop the desired metric anywhere you’d like in your dashboard. You can resize these Datablocks or even rearrange them once you’ve added more. Then, your WooCommerce data will automatically populate. Now, if you’d like to add KPIs from other tools into this dashboard in order to create a comprehensive view of marketing and sales, simply click back into the left side menu to search for the desired integrations you’d like to pull from. In this case, I’m also pulling “Sessions” from Google Analytics so I can draw correlation between the top of our marketing funnel and the bottom of our sales funnel. 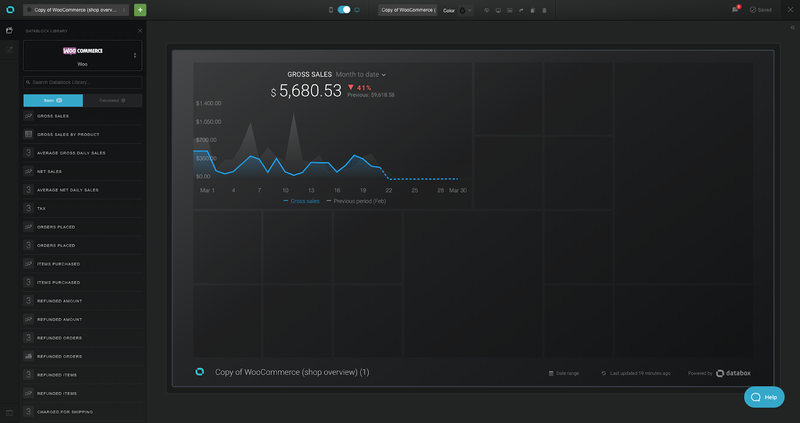 Existing users can view all of the available WooCommerce metrics here or download the shop overview dashboard here. 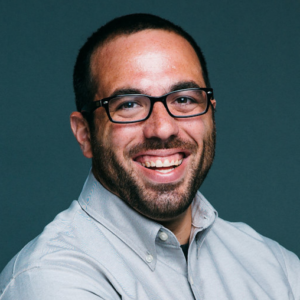 New to Databox? You can create a free account here. With Databox’s new Ahrefs integration you can analyze your website’s backlink profile, spot trends with your website’s domain rating, and find ways to improve your SEO strategy.